Luxury vinyl flooring has become very popular for both homes and businesses. Luxury Vinyl Tiles (LVT) and Luxury Vinyl Planks (LVP) are designed to have the look and texture of natural wood and stone. Additionally they are durable, water-resistant, cost effective and easy to install. While luxury vinyl floors require minimal maintenance an occasional deep cleaning is recommended when needed. ABE's vinyl cleaning process uses a cleansing agent formulated to remove dirt and grime from the floors surface and textured areas while leaving no harmful dirt-attracting residue. Floors are left sparkling clean. 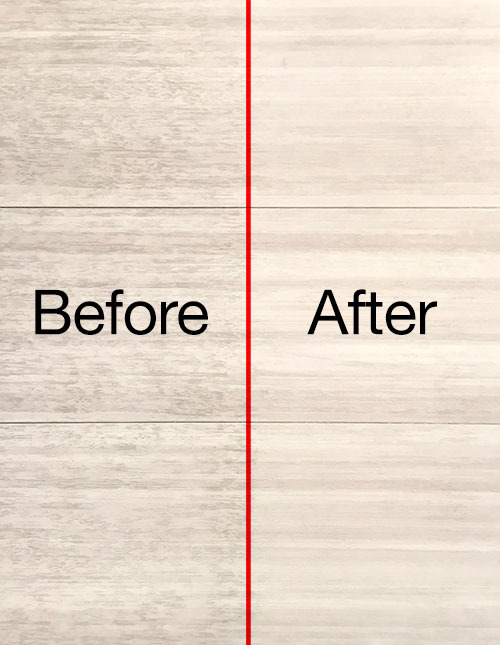 Dirt trapped in textured areas of luxury vinyl floor is removed. Floor is left sparkling clean.